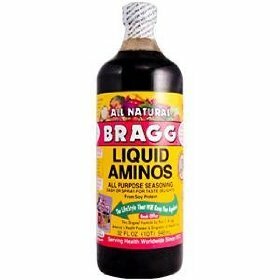 Bragg Liquid Aminos is a Certified NON-GMO liquid protein concentrate, derived from healthy soybeans, that contains the following Essential and Non-essential Amino Acids in naturally occurring amounts. Great on Salads & Dressings, Soups, Veggies, Rice & Beans, Tofu, Wok & Stir-frys, Tempeh, Casseroles, Potatoes, Meats, Poultry, Fish, Jerky, Popcorn, Gravies & Sauces, Macrobiotics. If you have any questions about this product by Bragg, contact us by completing and submitting the form below. If you are looking for a specif part number, please include it with your message.